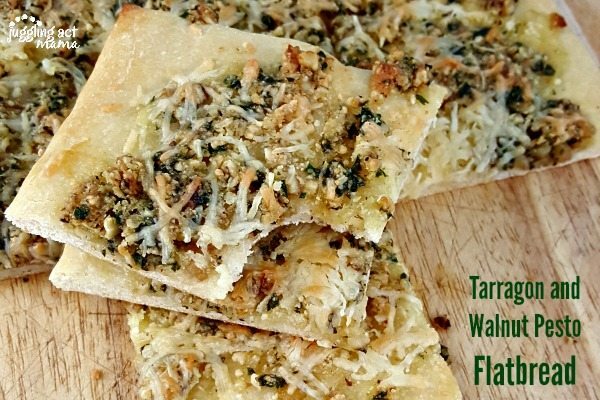 Tarragon Walnut Pesto Flatbread is a delicious and impressive appetizer for any occasion. Pair it with a dry white wine and you’ve got a delicious homemade happy hour! I love making simple recipes that look and taste impressive. It’s kind of fun to wow my friends and family – it’s like my super power. “I am Juggling Act Mama – with the power to turn ordinary ingredients into impressive dishes.” Okay, now that I have that out of my system, let’s talk happy hour. Who doesn’t love getting together with friends or your loved one to unwind? My problem is, we rarely have the time or extra money for a babysitter or going out. So here’s how to create a fun homemade happy hour at home. This is a great for relaxing with friends, or a special date night with your love. Start with this simple recipe, a chilled bottle of wine and your favorite music. What could be easier? Preheat the oven according to the directions on the flatbread refrigerator pizza dough package. 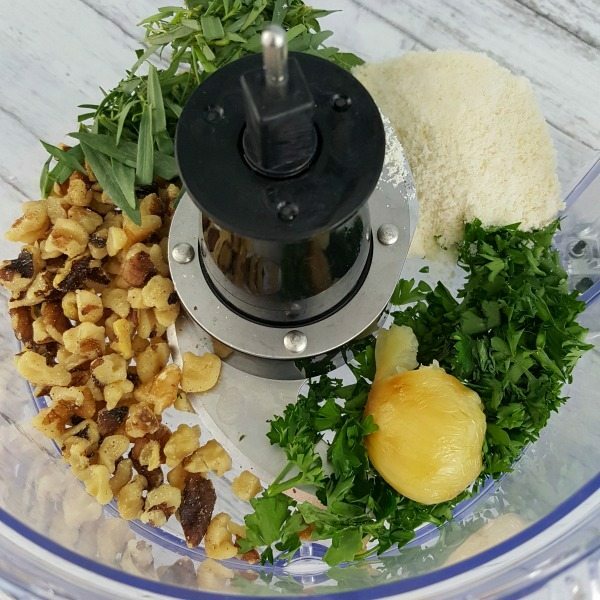 Combine the herbs, walnuts, Parmesan cheese and roasted garlic in a food processor. Pulse while drizzling in the olive oil. Season with salt and pepper to taste. Line a baking sheet with parchment paper. Roll out the flatbread refrigerator pizza dough on the baking sheet. 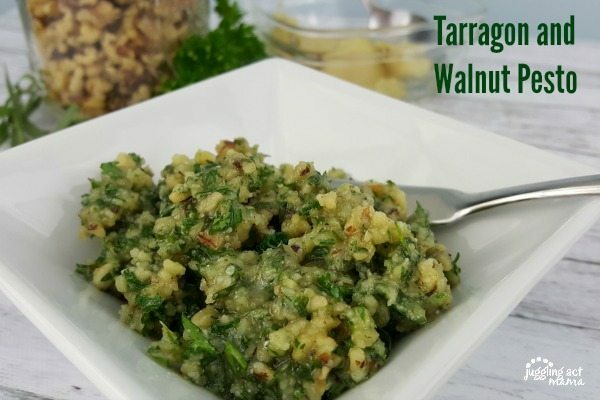 Spread the tarragon walnut pesto mixture over the dough. 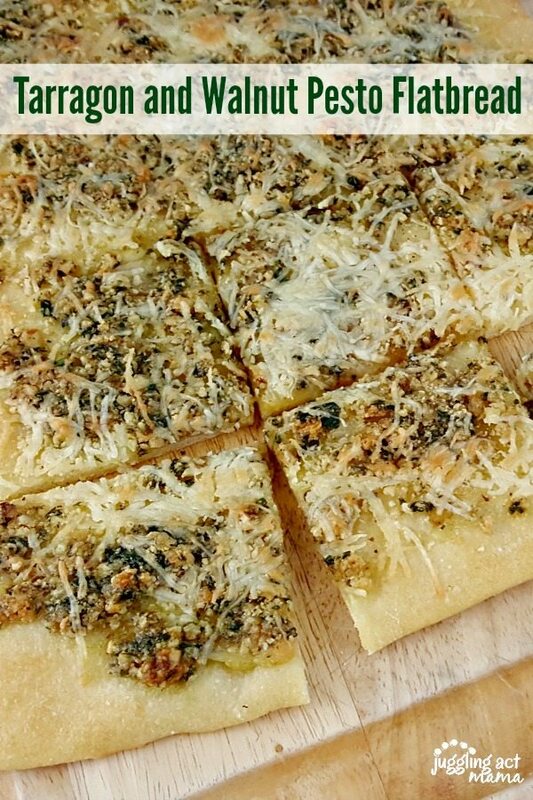 Top with the grated cheddar cheese and bake according to the directions on the package until the dough is crisp and the pesto and cheese are hot and bubbly. Remove from the oven and let cool 5 minutes before cutting and serving. Now I adore the flavor of tarragon, but if you’re not a fan, you can substitute basil for a more traditional pesto. You might want to check out my Basil Pesto Recipe. 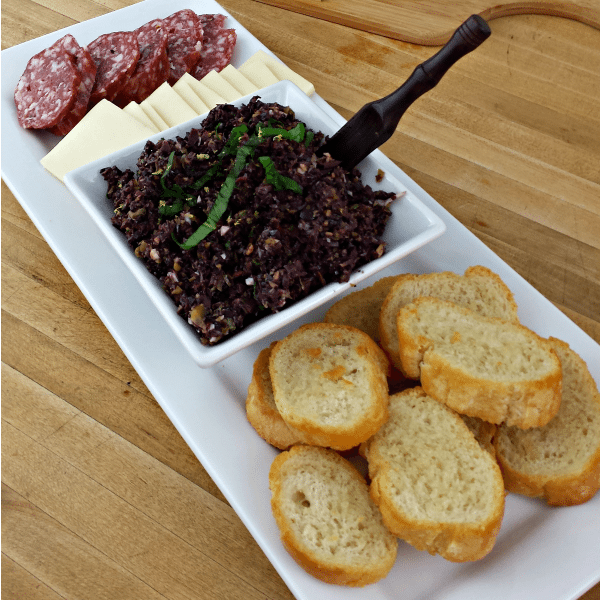 If you’re hosting a few friends, you might want to also try my Olive Tapenade Crostini recipe. You will love it! 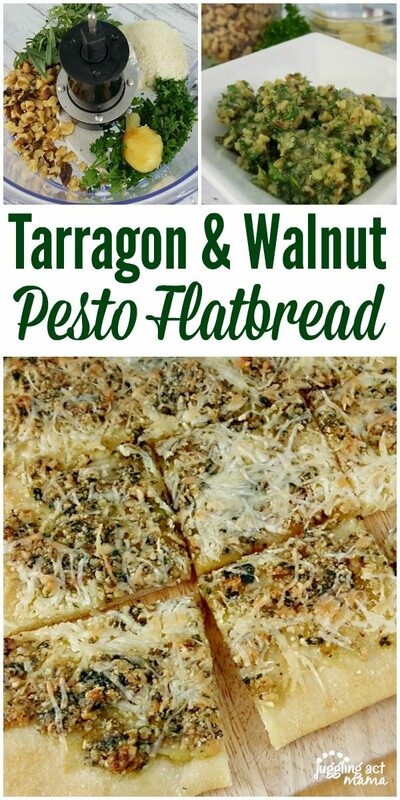 This Tarragon Walnut Pesto Flatbread looks so impressive, when really it’s just a cinch to make. I hope you enjoy it for your next homemade happy hour!